Have you considered the impact that your sign has on your business? 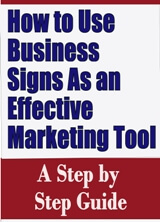 This Guide discusses signs, what they can do for your business, and how they can be used to your advantage. A checklist for ordering a business sign is also provided. Signs are one of the most efficient and effective means of communication. Signs help people find you; they reach people who are passing by your establishment; they present an image of your business. In short, signs, tell people who you are and what you are selling. A sign is the most direct form of visual communication available. In fact, so many people use signs without a second thought that it is easy to overlook their importance. When we cannot talk to other people directly in a given location, we tack up signs: wet paint, beware of dog, enter here, garage sales, etc. signs are the only form of mass communication directly available to everyone - they are the people's street communication system. Signs perform three major communications functions for your business; they give information and direction, provide a format for street advertising, and build your image. Signs can correct a poor location by substituting effective communication for poor site characteristics. If your business is located on a site which is not visible or in a building which does not not correspond with the goods or services offered, your sign can overcome this disability. For example, most buildings are not built to conform to the design needs of any particular type of tenant. Without an effective sign it is often impossible to determine what type of business is being conducted in a given building. In addition, when your site is located off a busy traffic artery or in an area which is not easily accessible your sign can communicate to people who are passing on a busy street several blocks away. If you are located off a busy freeway but far from an exit, your sign becomes your main device for directing people to your business. High-rise signs are used when a business is located away from potential customers' normal pathways of travel. Your sign provides an easily recognizable display format for the goods or services you are selling. For most businesses the street is where potential customers are. The message conveyed on the street reaches people who are close enough to make a purchase. Street advertising also help people develop a memory of your business name and the products and services you sell. People tend to buy from businesses they know. Signs can build an image for your business and help you identify with the market segment you are trying to reach. Through materials and design, a sign can appeal to a given group of potential customers. For example, some firms attempt to capture the youth market,others senior citizens, others unmarried single people and so forth. If you have a particular market segment that you wish to attract to your business, your sign can be an important means of bringing these people in.